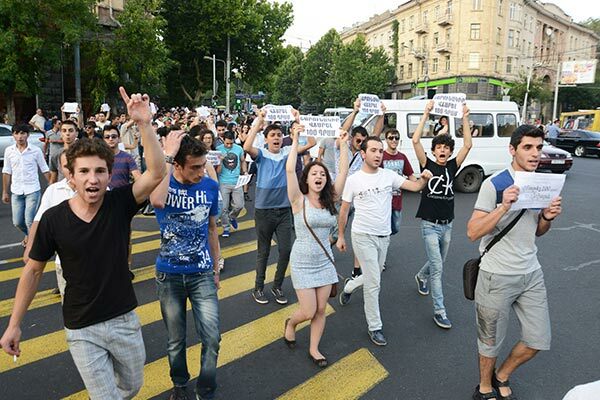 As youth activists continue social protests against the rise in public transport fares in Yerevan, certain economists and consumer rights advocates also raise questions about the economic feasibility of the move. After the announcement of the 50-dram (12-cent) rise in public transport fares last week the Mayor’s Office also presented the grounds for the move, suggesting that the bids for the fares to be raised submitted by route operators were based on inflations registered in recent years, the acquisition of new buses as well as costs connected with spare parts, fuel and lubricating oil. As they argued, it all resulted in their working at a loss. Meanwhile, Transport and Communications Minister Gagik Beglaryan earlier told media that the rise in fare rates was possible due to earlier increases in natural gas prices. According to estimations made by specialists of the municipality, a minibus tariff per passenger is 149.9 drams (36 cents) and a bus tariff is 157.3 drams. The municipality did not present the grounds for doubling the trolleybus fare rate – from 50 to 100 drams. Meanwhile, a non-governmental organization called Informed and Protected Consumer has done its own calculations, arguing that with good management the transportation costs could be kept as low as 71-93 drams per passenger and that minibus route owners were just raking in super profits, while the city authorities misrepresented the numbers, also lowering the real number of daily commuters to justify the costs. The organization says that the numbers suggested by the Mayor’s Office are not true to fact. “The suggested figure of 5,850 passengers a month being transported by a minibus means that they have 195 passengers per day. The same statement clearly indicates that on a daily basis minibuses make 6.5 runs (one run is 32 km), and this means that they transport only 30 passengers per full run or 15 passengers one way, which can’t be true. They actually carry at least 25-30 passengers, in which case the estimations would be not 5,850 passengers per month but 9,750. But even in the case with these inflated costs, the fare rate should not exceed 100 drams anyway, but should stand around 83 drams (20 cents), excluding profit,” said the organization’s president Babken Pipoyan. Stepan Safaryan, a member of the opposition Hello Yerevan faction in the Yerevan Council of Elders, says many of the fellow Republican friends of Mayor Taron Margaryan own bus routes, claiming that there is a conflict of interests for the mayor in this case. Media have speculated that among Republican Party members owning bus routes in Yerevan is also Republican parliamentary leader Galust Sahakyan, as well as Margaryan himself and his brother-in-law, Robert Sargsyan. Such publications have not been explicitly denied by the Republicans yet. Mayor Margaryan, who has been under criticism in recent days over the fare rise, has not made any public statement regarding the move yet. During yesterday’s working meeting at the municipality he only spoke about the quality of services. More public protests around the transport fare rise are planned for today. Meanwhile, more and more people have been joining the initiative of popular actor Hayk Marutyan, who was among the first to introduce the new culture of carpooling in the wake of the bus fare rise. Many well-known actors, singers, newspaper editors, as well as ordinary citizens have been offering free rides on their car to other citizens traveling in the same direction. The Hello Yerevan faction, meanwhile, said it would try to call a special session of the Council of Elders as well as dispute the rise in bus fares in court.